Fashion is not my thing! I’m much more comfortable in jeans and a hoodie (Yes, I’m in the Mark Zuckerberg fashion club). I’ve even toyed with the idea of buying multiples of the exact same shirt and pants to avoid having to decide what to wear every day. Before you laugh…this is exactly what Steve Jobs did. He did it to avoid having to waste mental energy trying to decide what to wear… and it seemed to work well for him! Despite my personal preferences, I fully understand the power of perception. What people believe to be true become true for them. Love it or hate it, people judge you, and make assumptions about you, based on what you wear. One maverick entrepreneur went as far as tracking exactly how much money he spent on clothes and how it directly impacted his business. This particular entrepreneur, Neil Patel, spent over $160,000 on clothes over a twelve month period. Crazy, right? Well maybe not! He tracked his revenue based on what he wore to each sales meeting. When he wore his ridiculously expensive clothes, his closing ratio jumped from around 25% to over 40%. Because of the high dollar value of each sale that he closed, that 15% boost in closing ratio amounted to almost $700,000 in additional revenue. As I’ve talked about before, when we take the time to carefully script and sculpt the frame through which other people view us, it can have a tremendous effect on what other people think and the way they react to us. Well, after hearing Neil’s story, I decided I should give more attention to what I wear for these videos. My wife and I took a road trip down to Lafayette, about 90 miles south, to do a little clothes shopping for a few video projects that I was working on. Maven Menswear is a great little store which, despite its small size, is packed full of great clothes. Not only do they carry great brands like Farah, Ben Sherman, and DL 1961, they also provide some of the best customer service I’ve experienced. After what felt like an eternity (I hate trying on clothes! 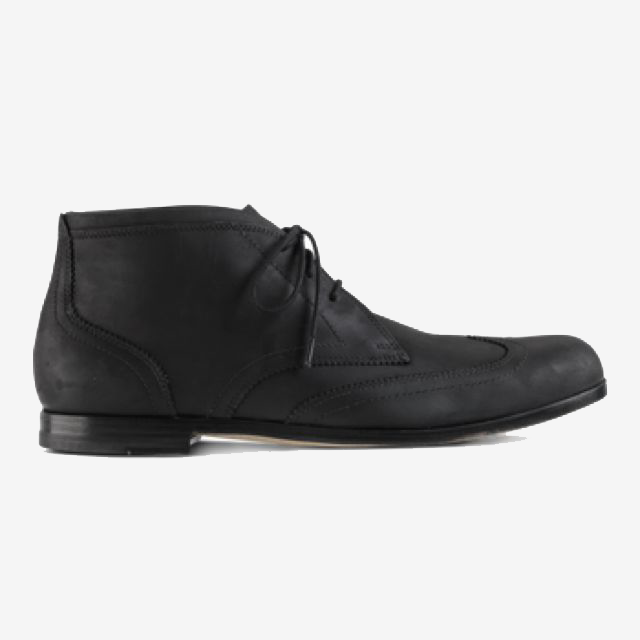 ), I had a few shirts, pants, and a new pair of Cole Haan Chukas. I felt great! I’m not sure if I felt great about the new clothes, or simply the fact that I was finally done trying on clothes. The first few times I put on the clothes and new shoes, everything fit and felt perfect. However, after the third time I put on the Cole Haan Chukas, the sole on the right shoe split… and this was when the experience began taking a turn for the worse. I’m sorry to hear that this has happened. What size did you take in those? I’ll check to see what we have left in stock or if my sales rep still has stock left in them. We’ll get a new pair for you if they have them in stock. If not I can send you pics of what they do have in similar styles. I spoke to my sales rep about swapping out your shoes and unfortunately those are a seasonal style and they no longer have any left in stock. However, I spoke to Cole Haan customer service and they said for you to email photos of the shoe to customerservice@colehaan.com. Title the email as Defective Shoes. If they feel that it is a factory defect, they should be able to repair the soles since they don’t have them in stock anymore. If they give you any trouble let me know and I’ll contact them to see if I can help expedite the process. Let me know how you’d like to proceed. If you really like the boots and want to get them repaired I can also take them to a local shoe repair shop, or if you’d rather have your money back or get a different pair we can do that as well. We want you to be happy with your purchase from Maven. I really like the shoes and they matched the clothes that I had purchased for the video shoots, so I decided I would reach out to Cole Haan per his instructions. My initial email to Cole Haan was at 5:26pm on Thursday, January 29th. I am sorry to learn about the problem you are having with your Cole Haan footwear. We invite you to send the item back to us for inspection by our Quality Team. Once we receive the return shipment, the item will be inspected. When it is determined to be defective, it will be discarded and we will issue a Cole Haan Gift Card for the current selling price of that style. The gift card may be used at any Cole Haan retail store or at www.colehaan.com. Please note that if the item is determined not to be defective, it will be returned to you. Within the next 5-7 business days, you will receive a letter via USPS containing instructions on how to return the product to us. Please let me know if you have a question or need more information. Thanks again for your past and continued business. Five to seven days! What? Couldn’t they just email it? I didn’t have much choice, so I waited. Finally after two weeks of back-and-forth and waiting, Cole Haan basically said to first try to resolve the issue with the store where I purchased the shoes. Or I could ship the shoes back to Cole Haan, wait until they inspected them and then, if they found the issue to be a factory defect, they would issue a Cole Haan gift certificate. Let’s do a quick recap. 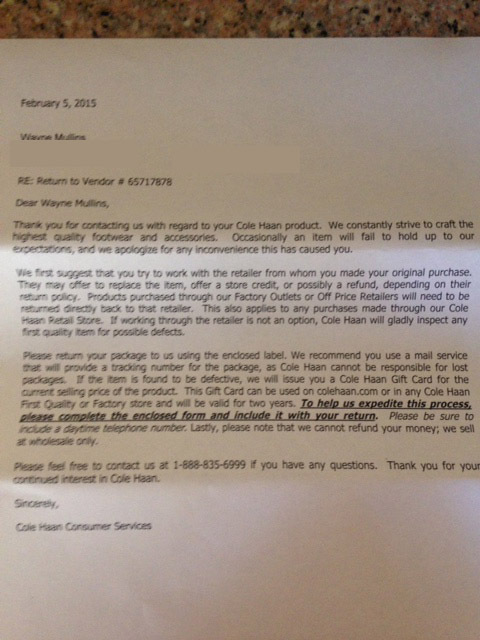 It had taken two weeks since I initially contacted Cole Haan for them to respond that they would send me a return shipping label and a letter telling me to first try and resolve the issue with the store. I could only imagine how the rest of their process would go. I emailed the owner of Maven Menswear a copy of the letter from Cole Haan and asked if he would be okay providing me with a store credit. He responded within 30 minutes. Apologized for the inconvenience, and gladly offered a store credit. In a world of overnight shipping and 365 day return policies, it seems Cole Haan has failed to keep up with the times. It would have been one thing if I hadn’t paid much for the shoes. But I had. First of all, I wasn’t expecting the sole to split open. Second, I certainly didn’t expect such slow customer service from such a premium brand. 1) Your customer service MUST match the expectations set by your brand. Simply put, if you’re selling premium priced products, people are going to naturally expect premium service. If you’re not willing to provide it, then it’s imperative you find ways to educate and inform your customers of your customer service standards. 2) Engineer your customer service experience – particularly your complaint resolution service. Customer service occurs each and every time someone interacts with your company. It could be as simple as answering a customer’s question to as involved as resolving a major issue. Regardless, you need to have carefully engineered what will take place during each occurrence. 3) Never neglect the power of a single customer. With the world at the fingertips of each and every person, it’s important that you never neglect the power of a single customer. Some upset customers will post their dissatisfaction on Facebook or Twitter. Others will write entire blog posts about it. And others may opt to tell their friends. But regardless, never neglect the power your customers hold. This example of poor customer service from Cole Haan caused me to carefully reexamine our policies and procedures when it comes to handling customer complaints and issues. It doesn’t matter how big or how small your business is, customer support is a vital component. And without a plan of action in place, you’re going be left to “wing it” when issues do arise. Will I ever buy another pair of shoes from Cole Haan? Maybe. Maybe not! One thing is certain; I’ll never purchase another pair of Cole Haan shoes unless I know I can return the shoes directly to the store where I purchased them.